METAIRIE, La. 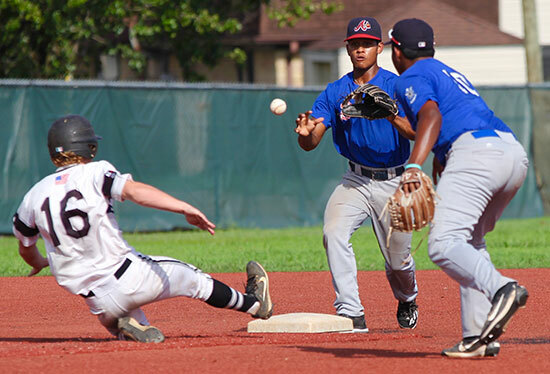 — This Thursday, eight of the best 19-and-under baseball teams from across the country will gather in Shelby, N.C., for the 2017 Senior American Legion World Series. The Bryant Black Sox (39-7) will be one of them. Yes, after several years in which the team and manager Darren Hurt had come so close to getting there only to be denied — sometimes (like 2016) in some of the most bizarre, gut-wrenching scenarios, the Sox made it with two tight victories on Sunday. They earned the chance at the Mid-South Tournament championship and the bid to the Series with a 5-2 win over the LaPlace, La., Pedal Valve Cardinals (go here) then avenged their lone loss of the tournament as Beaux Bonvillain and Boston Heil combined on a three-hit shutout in a 3-0 win over the Ada, Okla., Braves, each the champions of their respective states. The championship game was played at the fourth different venue for the tournament, Mike Miley Stadium, after the earlier games on Sunday were played at Tulane University. Bonvillain, on a pitch count after not pitching much of the summer, worked into the fourth using 69 pitches. 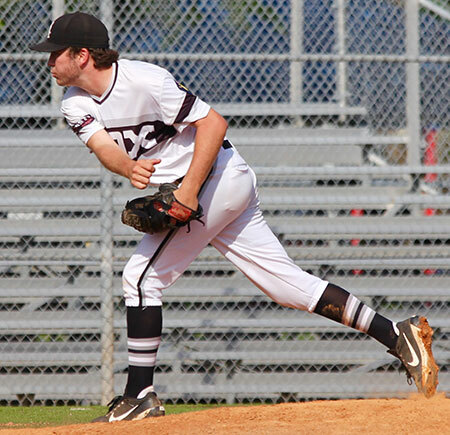 He walked two and struck out three and had just given up the third hit of the game for Ada. Heil got the call from Hurt at that point and proceeded to retire all 10 batters he faced to close out the game. Few have had more faith in Heil than the Sox’ manager over the last two summers. And, on Sunday, he once again showed why. The right-handed side-slinger fanned two and proved to be extremely difficult for the Braves to square up. The Sox’ hitters were held to six knocks but most of them came at opportune times. 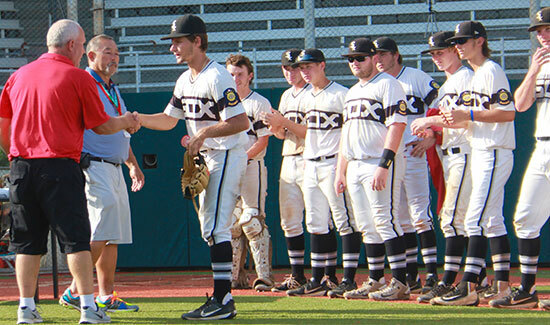 Jake East, the Sox’ shortstop, was named the Outstanding Player of the tournament and he was right in the middle of the team’s fast start. That Bryant fast start wasn’t just on offense, however. In the top of the first, Ada’s Joshua Lewis hit the second pitch of the game for a double to the gap in left-center. Darian Luper got a sacrifice bunt down to move Lewis to third but then Bonvillain got three-hole hitter Cole Broughton, his adversary on the mound, to hit a grounder to Scott Schmidt at third. Lewis, going on first contact, was caught in a rundown between third and home with Bonvillain eventually making the tag as Broughton sprinted into second. With clean-up hitter Trejan Blue at the plate, Bonvillain caught Broughton wandering off the bag, ran at him and got him to commit to trying to reach third. A quick throw to Schmidt resulted in an inning-ending tag. To capitalize on the momentum created from all that, the Sox scored twice in the bottom of the first. Logan Allen was hit by a pitch and, on a hit-and-run, East slapped a grounder through the vacancy on the right side for a single. Allen cruised to third. That brought up Seth Tucker who got a perfect bunt down to the right side. Allen scored and East beat the play at first for an RBI single. With one out, Alex Shurtleff was plunked on a 1-1 delivery, loading the bases for Jake Wright, who came through with a sacrifice fly to center. East, hustling home, beat the rap at the plate on close play. Ada didn’t manage another base-runner until a one-out walk in the third. Bonvillain struck out the batters on either side of the free pass but, a single up the middle by Lewis and a walk to Luper following, loading the bases with Broughton coming to the plate. After getting a strike in to the Braves’ slugger, Bonvillain got him to fly out to Allen in center to keep it 2-0. 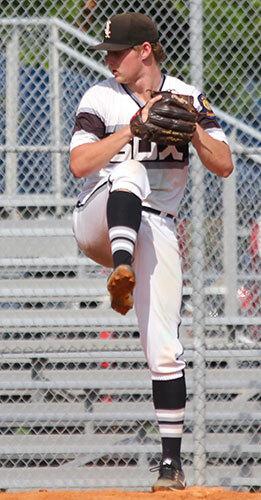 In the fourth, the Bryant lefty retired the first two then surrendered the single to Ethan Jackson. Heil came in and got Takota Frank to tap back to the mound for the third out. Bryant threatened to add to the lead in the fourth. Wright led off with a single and, on another hit-and-run, made it to second in time as Schmidt grounded to the second baseman. A throw to the shortstop at the bag was too late but Luper alertly relayed to first in time to nap Schmidt. Aaron Orender was hit by a pitch then Coby Greiner grounded into a force at third. With two away, Allen drilled a 2-0 pitch to left for a hit but a perfect throw home by Blue was in time to retire Orender. Any momentum that may have created for the Braves was drained by Heil. Mekhi Edwards lined softly to second, Dayne Bowerman struck out and Lewis flew out to Shurtleff in right. And Bryant added on in the home fifth. Tucker was hit by a pitch with one out and stole second. With two down, Shurtleff came through in the clutch with a base hit to center for the RBI. The Sox made a bid to get more when Shurtleff stole second and Wright walked but, after a pitching change, the Braves avoided further damage. The rest was on Heil and the defense. In the sixth, Luper grounded to third, Broughton bounced out to short and Blue’s line drive was snared by Schmidt. 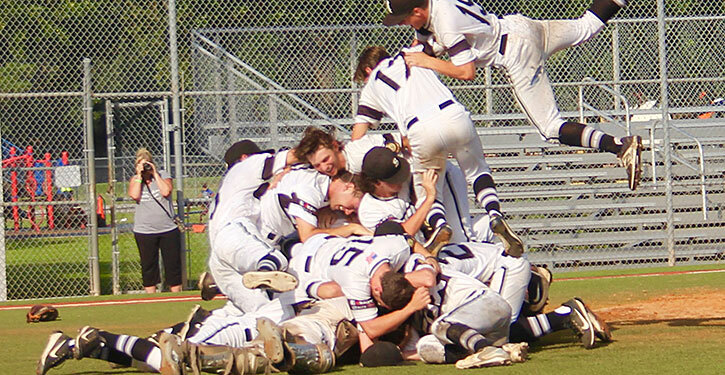 To finish, Heil struck out Ty Elliott, got Ethan Jackson on a comebacker and, after an eight-pitch battle with Frank induced a fly to Shurtleff in right that started Bryant’s second victory dogpile in a week (following their State championship on Monday). 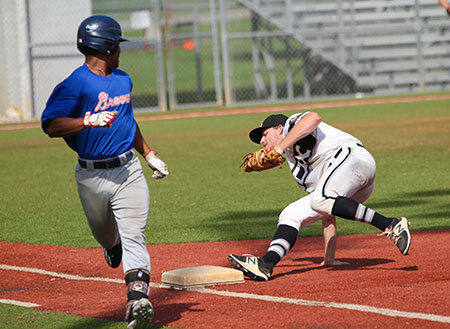 Hurt’s past Black Sox teams had been burned by the obsolete bracket for Regionals and, until this year, the State tourneys — the old College World Series bracket that has long since been rejected by the NCAA. It requires an extra game for the team that wins the winners’ bracket final. 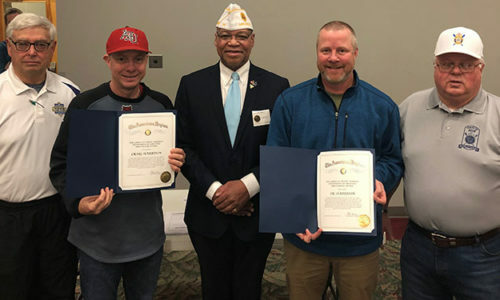 Instead of advancing to the championship round to await the survivor of the losers’ bracket, that team — in this case, Ada; in the past, Bryant — had to play a losers’ bracket team in an “extra game”. Win or lose that contest, that team (Ada) advances to the championship round. The only difference is whether they’d need to be beaten twice or once to be denied the title. After burning the Sox in the past, they actually benefitted from it this year. The Oklahoma team had to play Louisiana on Sunday morning (after the Saturday game was rained out). With the extra day, Pedal Valve’s top two pitchers became available and the Cardinals edged the Braves, 4-3. So, Ada had to use pitching and it cost them their advantage. Another thing that has cost the Sox in the past but helped this time was the decision to make the last two games seven innings instead of nine. It allowed Alex Shurtleff to go the distance in the first game on Sunday — though his pitch count probably would’ve enabled to finish a nine-inning outing — then Bonvillain and Heil were able to cover the seven in the final — though the way Heil was dismissing the Braves, that may not have mattered either. Let’s just put it this way, Darren Hurt and his Black Sox were due for some breaks to go their way. Even with that, they earned it, coming back through the losers’ bracket at State and the Regional. They earned it all right.